catalysts the catalyst is a part of the effluent which also contains an auxiliary, such as a surfactant. 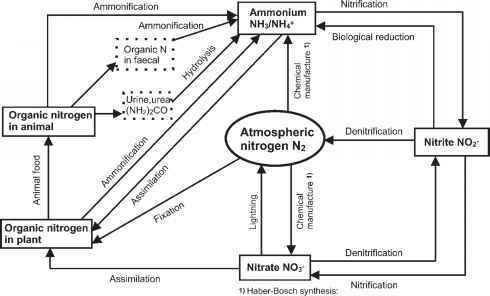 In a technical-scale synthesis large amounts of raw materials are used which frequently contain impurities that can also be transformed by reactions (N ^ N1, N2 inert). The wastewater produced contains all these materials; and the product C must therefore be separated. Complete separation of C is not economical and thus the target product also contributes additional pollution left in the wastewater. Chemical companies are often interested in changing this situation by developing new processes or by optimizing existing ones, particularly if they were developed several decades ago. • New ways of chemical synthesis. • Enzymatic methods or conversions by microorganisms. • New raw materials with lower impurities content. • New catalysts with higher selectivity. • New methods for saving water (Sections 13.2.2 and 13.2.3) as well as relieving end-of-pipe treatment. • More effective methods of product seperation from all other materials. Modernization of existing processes or development of new ones along these lines is not only done to lower the cost of production and waste management but also to obtain products of higher purity and to reduce side-effects of pharmacological products.